Use the resources below to learn more about how to safely farm and ranch near pipelines and underground utility lines. Permanent signs are often placed along the route of underground pipelines and utilities to remind you that lines are located nearby. Marker signs include the name of the operator, type of line and emergency contact number. Line markers identify the general, but not exact, location of underground lines. 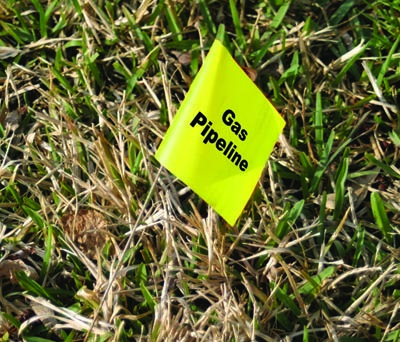 Utility service lines maintained by your local gas company may not have permanent pipeline markers. Pipeline markers are important safety signs. It is a federal crime to willfully deface, damage, remove or destroy a pipeline marker. If you notice a damaged marker, or accidentally damage a marker, please contact the pipeline or utility line operator. Pipeline and utility line operators use flags, paint and stakes to mark the location of their lines. Underground pipelines are marked with yellow flags and paint, and electric lines are marked with red flags and paint. The National Pipeline Mapping System’s (NPMS) Public Viewer allows you to view and print maps of hazardous liquid & gas transmission pipelines. Maps generated by NPMS show the approximate location of transmission pipelines in relation to specific addresses, major roads, zip codes, cities and counties. Maps do not allow you to identify the exact location of pipelines and should not be used as a substitute for calling 811 prior to agricultural excavation or digging activities. Watch a tutorial video for how to use NPMS. You can also use NPMS to access contact information for transmission pipeline operators in your community. The U.S. Department of Transportation’s Pipeline and Hazardous Materials Safety Administration (PHMSA) manages NPMS. 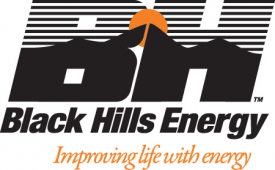 Currently, NPMS does not include gathering or distribution pipelines. 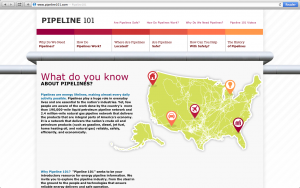 Some state regulatory agencies also provide maps showing the general location of pipelines in their state. View a testimonial video from a farmer who shares his first-hand experience of encountering a petroleum pipeline while installing field tile. Learn more about pipelines, how they work, why they’re necessary and safety tips for those living or working near them. Contact the Community Liaison Services manager in your region if you have questions about the pipelines on or near your property. The Community Liaison Services program is provided by the Pipeline and Hazardous Materials Safety Administration (PHMSA). Learn more and find the team manager in your region at http://primis.phmsa.dot.gov/comm/CATS.htm. Contact pipeline and utility regulators in your state if you have questions about the pipelines or underground utility lines on or near your property. 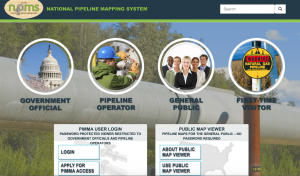 Find contact information for state regulators and view state-specific pipeline and utility line information at http://primis.phmsa.dot.gov/comm/States.htm.